Blockchain, cryptocurrencies, and all the related infrastructure have broken into our lives and have been dominating international headlines ever since. Despite the fact the technology is still in its infancy, many people all around the globe have been trying to make money by investing in related projects. Why are ICOs so popular among international investors? By the way, for those of you who don’t know, an ICO stands for an Initial Coin Offering, which makes it comparable to an IPO (an Initial Public Offering in the stock market). Basically, during the ICO, the company offers its tokens, which is the crypto version of the company’s stock. This happens through adding all the required info (the description, the amount, and the ID) to the corresponding blockchain. - These are very cheap and affordable assets without credits, margins, bails, bonds, and other related things. So, ICOs and ITOs are way cheaper then IPOs, which is a lifesaver for small-scale and mid-scale businesses. - There is the absence of a great deal of bureaucracy with filling out endless forms, applications, agreements, passing interviews with bankers and investors, and so much more. With that being said, ICOs are much easier to arrange and implement. - This is a hi-tech event. After making a smart contract, crediting bonuses, profits, products, and pretty much everything else is done in automated mode. The most successful ICO to date is ICO EOS (developing the software to decentralize apps). Over the first 5 days of the ICO, they managed to collect 651 902 Ether ($170 million at that point). Today’s market cap as around $11 billion. 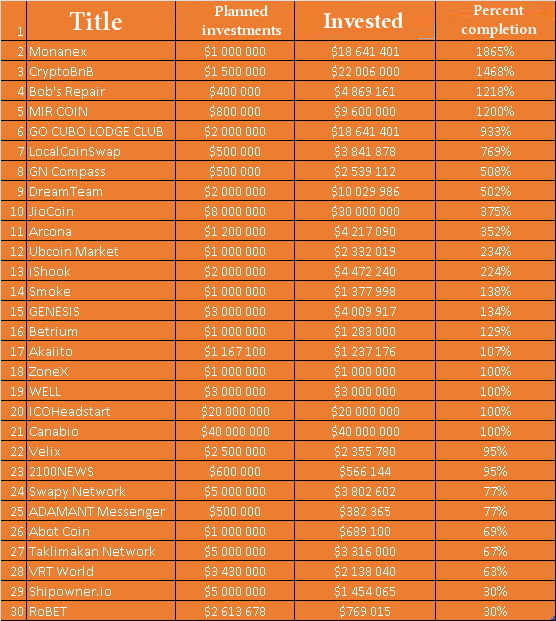 The second-most successful ICO to date is ICO Storj (developing next-generation decentralized data storage). The expected sum of $30 million was collected in less than a week. Today’s market cap as around $162 million. On the other hand, the fastest ICO to date is the ICO for Brave, a next-generation browser by the FireFox team. They managed to collect $35 million over the first 30 seconds! However, arranging an ICO to collect several hundred thousand dollars is a heavy burden for most small businesses out there. However, there is a solution for them. It’s called a pre-ICO. It allows such businesses to start collecting investments by selling tokens at a discount before the actual ICO. At the same time, such businesses may use the pre-ICO to get themselves up and running with the process and simultaneously check the potential interest in their offers. Number one. Monanex (monanex.com, MNX token). It’s all about developing a platform for exchanging cryptocurrencies for fiat money at affordable fees – just 0,01% for ETH and BTC. The minimal target was $1 million but they have already raised 18641401 dollars. This means that the actual funds raised have already beat May’s target of $17. The ICO ends on May 14th, 2018. Number two. CryptoBnB (monanex.com, CKey token). This project is about creating a trusted blockchain-based platform for renting and leasing residential property. With the minimal target of $1,5 million, they have already raised $2 million. The ICO ends on May 25th, 2018. Number three. ICO Bob's Repair (bobsrepair.com, BOB token). This is going to be a decentralized blockchain-based anti-fraud platform of house repair services. With the minimal target of $400K, they have already raised $4,8 million. The ICO ends on April 30th, 2018. Number four. ICO MIR COIN (mircoin.co, MIR token). This is going to be the project aimed at designing a new cryptocurrency and a dedicated platform – MIR COIN and MIR PLATFORM. With the minimal target of $800K, they have already raised $9,6 million. The ICO ends on May 27th, 2018. Number five. ICO GO CUBO LODGE CLUB (goclc.io, GO token). This is going to be the project aimed at designing a new tourism ecosystem, with efficient searching mechanism, offering comfortable conditions at affordable prices. With the minimal target of $2 million, they have already raised $18,6 million. The ICO ends on May 29th, 2018. - GN Compass (finance, gncompass.com, GNCT token) – a credit platform backed by a Swiss trust fund (to the amount of 140 million dollars), with the option for investors to sell their portfolios in chunks. - ZoneX (gaming, zonex.io, ZNX token) – arranging and hosting international online eSports gaming contests for PC, PlayStation, and Xbox. - WELL (health, joinwell.io, WELL token) – a network for doctors. - Canabio (health, canabio.net, CNB token) – creating and producing cannabis oil based on a patented recipe. - Velix (Internet, velix.id, VXD token) – developing Velix.ID – a system allowing you to verify the legitimacy of a business or individual. - 2100NEWS (Internet, 2100news.io, NWS token) – a news portal about cryptocurrencies, ICOs, and financial markets. - Abot Coin (finance, abotcoin.com, AbotCoin token) – создание цифровой валюты и платежной системы. It’s easy to notice that these ICOs embrace a range of fields – from gambling to finances and fixed property. According to the 45th Vice President of the United States Al Gore, “…the fact that within the bitcoin universe an algorithm replaces the function of the government …[that] is actually pretty cool.” We cannot but agree with this statement!